It's 23:05 in Donovaly, Slovakia right now. Live View A live view from Donovaly. Donovaly: Nová Hoľa Cable Car, 0 miles away. Banská Bystrica: Namestie SNP, 10.5 miles away. Belá-Dulice: Jasenská Dolina, 13.8 miles away. 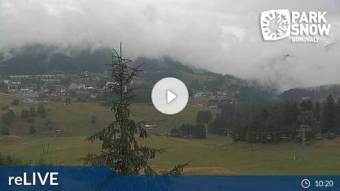 Ruzomberok: Malinô Brdo, 14.3 miles away. Horná Lehota: Chopok South, 15.2 miles away. Turcianske Teplice: Spa & Aquapark, 16.4 miles away. Demänovska Dolina: Jasna - Lukova, 17.5 miles away. Martin: Winter Park Martinky, 18.6 miles away.